I love the little mini photo album/brag books that you can buy in the album section of Target, Wal-mart, etc. They fit 4x6 photos and are perfect to use for a lot of things. 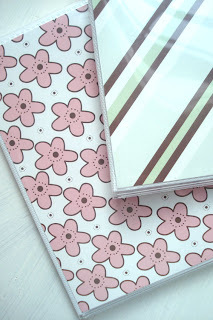 One of my favorite ways to use the mini albums is to create small communication books. My favorite type of communication book is a "What's wrong with this picture?" book. 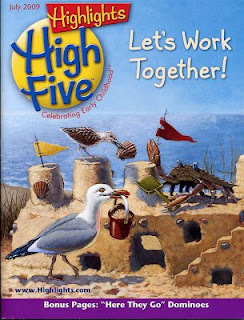 We have a subscription to the early childhood version of Highlights Magazine, High Five, that has a hidden and silly pictures section each month. Sometimes the pages in the magazine are loaded with too many images so when my son was 18 months and a little older, he had a hard time focusing on the details. I created little communication books with simpler images that I found in magazines and online and I cut them out and stuck them in the mini albums. The magazine and web images I found portrayed something silly or wrong in each image... but there was only one problem on each page... instead of several. Putting these books together takes time if you are sorting through magazines, but you can also easily use Google images to find many silly pictures that you could print out and use. Once you have put a book together, you can use the images to stimulate conversation with your child. These communication books are also great for helping kids learn to look for details, develop visual discrimination skills, build descriptive language, and increase vocabulary. Another step to personalize your communication books would be to create your own silly photos to add to the book. We are working on adding to our books by snapping photographs of things we see in our house that are not the way they should be (upside down lamp, guitar being used as a baseball bat) and just silly things that my son does. Question: What's wrong with this picture? Question: What do we use buckets for? Answer: to put toys, to store things, to carry things, etc. I begin each conversation by asking, "What's wrong with this picture?" Sometimes my son would say, "I don't know." Usually I'd wait a few minutes and just have him look at the picture for awhile. If he is unable to come up with anything (which happened a lot when he was younger), I answered the question for him or prompted him by pointing at the picture and asking questions like, "Can cinnamon rolls row a boat?" Then I'd laugh or say, "that's silly!" and ask, "who can row a boat?" He would typically answer, "I can row a boat" or "people row boats, not cinnamon rolls!" Over time his ability to find the silly things in the pictures improved and the descriptive language he used increased in complexity. I also love this activity because it helps teach kids the many functions of objects... but most of all, looking at silly pictures is funny and allows you to have some time to laugh together and be goofy... especially if you are creating your own goofy photos or hunting through magazines together!